I am not a cocktail girl. Not one bit. I am most definitely a wine or beer girl, 100%. Although I do enjoy a traditional margarita with salt on the rim, I haven’t touched a sweet, fruity drink since my bachelorette party last year. Don’t get me wrong, I had a great time celebrating with all of my girlfriends, but let’s just say I won’t be having any fruity or pink drinks for a long time. Maybe ever again. Thank you, Cinco De Mayo weekend + too many strawberry drinks + sombreros. Despite my non-interest in fun cocktails, I do have a major interest in boozy desserts that taste like typical “umbrella drinks.” My coworkers and I went to Dewey Beach this past weekend and although there was quite the selection of rum in many different infused flavors, I decided to bring MY rum in the form of this piña colada bar. I mean, can you invite the dessert queen to a beach party weekend and expect her not to bring a boozy dessert? The answer is no you cannot. 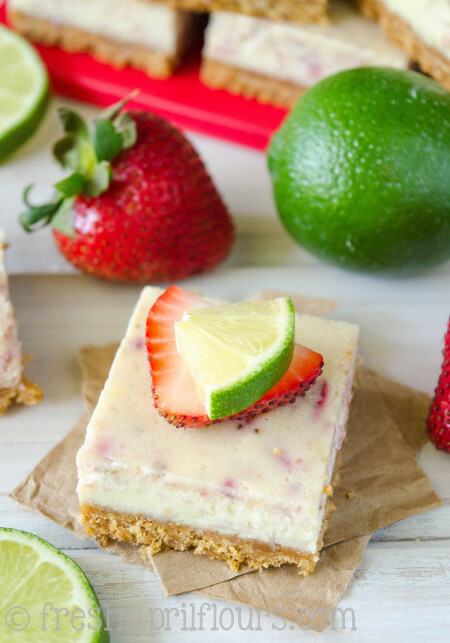 Although there is no actual alcohol in these bars, you can most certainly add some to make these truly a cocktail dessert. See my notes at the bottom of the recipe for suggestions. On the opposite hand, if you don’t like rum, simply omit the extract. You may just need to reduce the baking time by a few minutes. For the filling, I upped the cream cheese because there is a lot of moisture going into these bars: smooth, creamy sweetened condensed milk, sweet and slightly tart crushed pineapple, a hint of rum extract, and a touch of coconut extract to kick the coconut flavor up a notch. 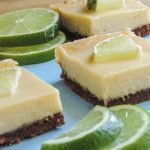 Just like the key lime bars, these will need to cool to room temperature and then sit in the fridge or freezer before they’re ready to cut and serve. It really is the hardest part. 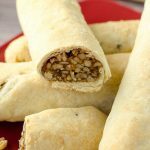 Prep only takes 15 minutes, and you can whip up the filling during the 10 minutes it takes to bake the graham cracker crust. Let me tell you what– bringing this bar to the beach was a great decision on my part. 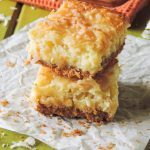 For me, there is no such thing as too much coconut in my life, and these bars are jam-packed with it. 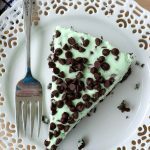 It’s the perfect summery dessert. 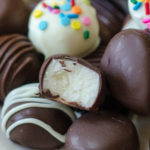 The coconut sprinkled on top browns just a little bit, so the slight toasted coconut flavor in each bite meshes well with the sweetness and rumminess (?! it’s totally a word right now) of the bar. My favorite part of the bar is the caramelized edges that come from the baking of the pineapple juice. It makes the bars just the right amount of sticky and chewy that belong in a dessert. To make things even more fun, I topped my bars with a maraschino cherry, so it was essentially a chewy cocktail. Now that I’ve typed that, it sounds kind of gross, but I promise, these bars are a tropical dream. 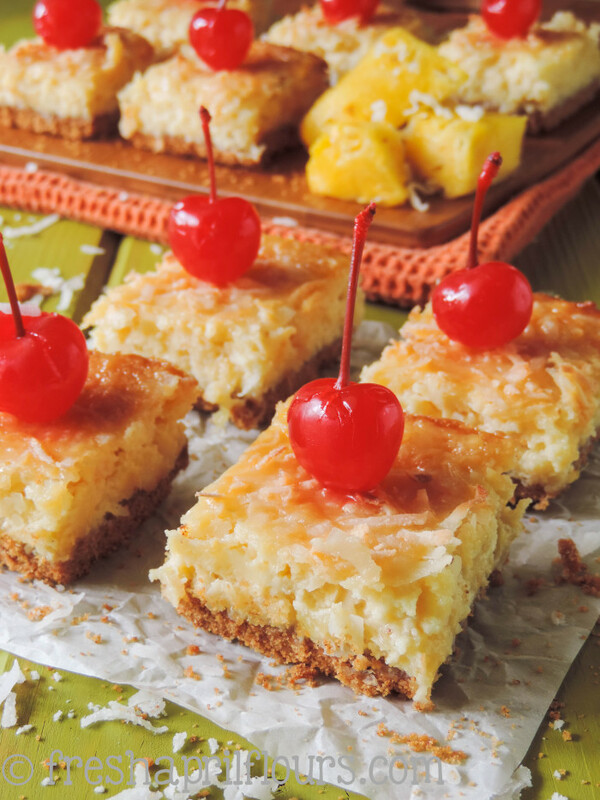 If you like piña coladas, you must try this dessert. And the best part? You can eat ALL of these bars and not have a hangover! Ok, ok, please don’t do that… It’s not so great for your health! 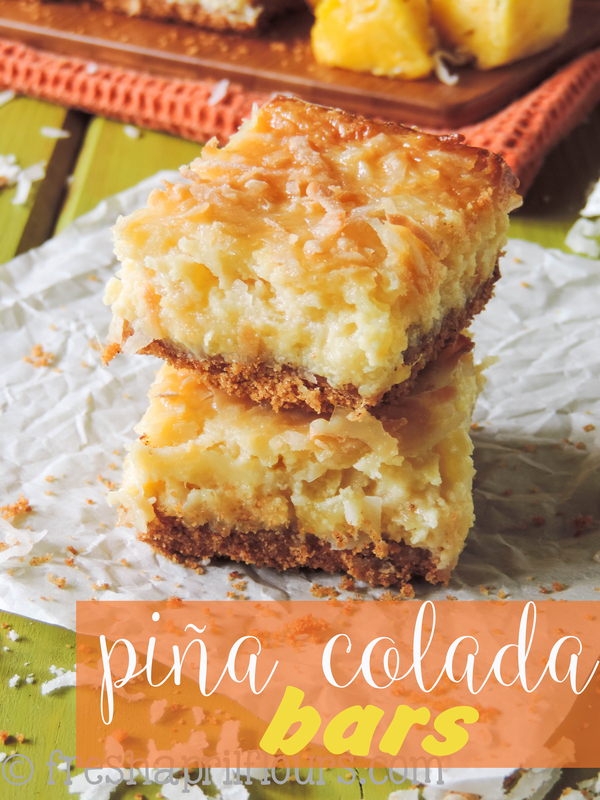 Besides, these are too good not to share with fellow piña colada loving friends! Piña coladas never tasted so good! 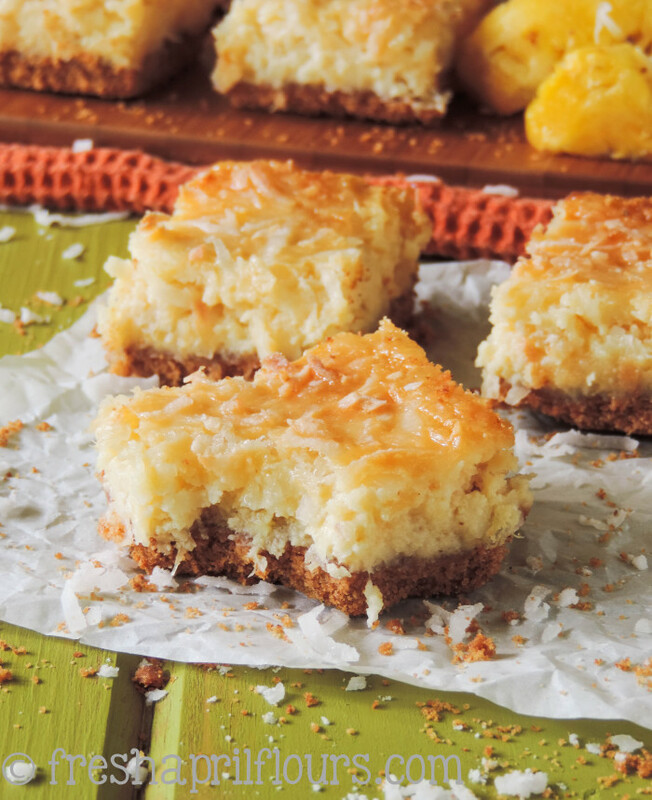 These tropical pineapple and coconut bars are the answer to your summer sweet tooth. Line an 8″ x 8″ or 9″ x 9″ baking pan with foil. Leave an overhang on the sides and spray with nonstick spray. Set aside. In a food processor, pulverize graham crackers. Once crackers are a fine crumb, add brown sugar, cinnamon. Pulse to blend. Pour mixture into a medium sized bowl and mix in melted butter. Press mixture evenly into prepared baking pan, being sure to press firmly. 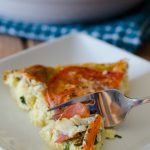 Bake crust for 10 minutes. In the bowl of a stand mixer fitted with the paddle attachment, or in a medium sized bowl with a hand mixer, beat cream cheese on high until smooth. Beat in egg yolks one at a time, scraping down the sides as necessary. Beat in sweetened condensed milk and coconut and rum extracts. 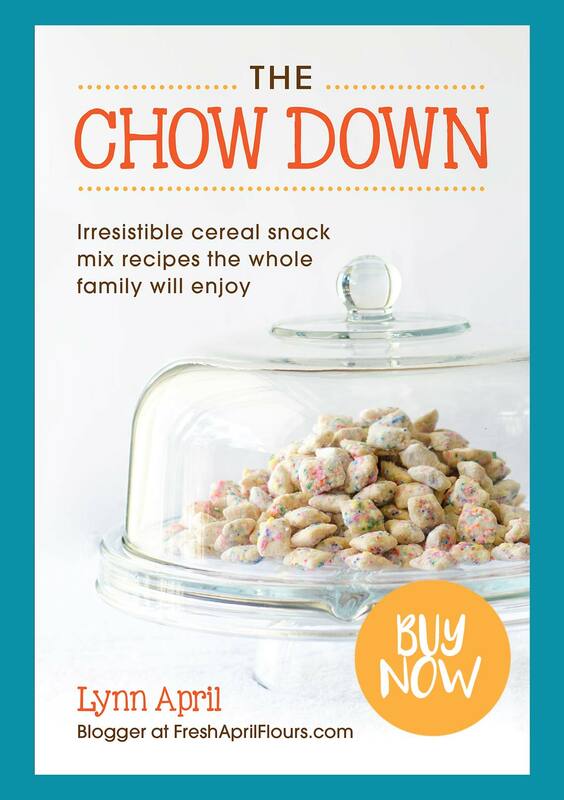 Add the can of undrained crushed pineapple and 2/3 cup of the flake coconut and mix on low speed until combined. 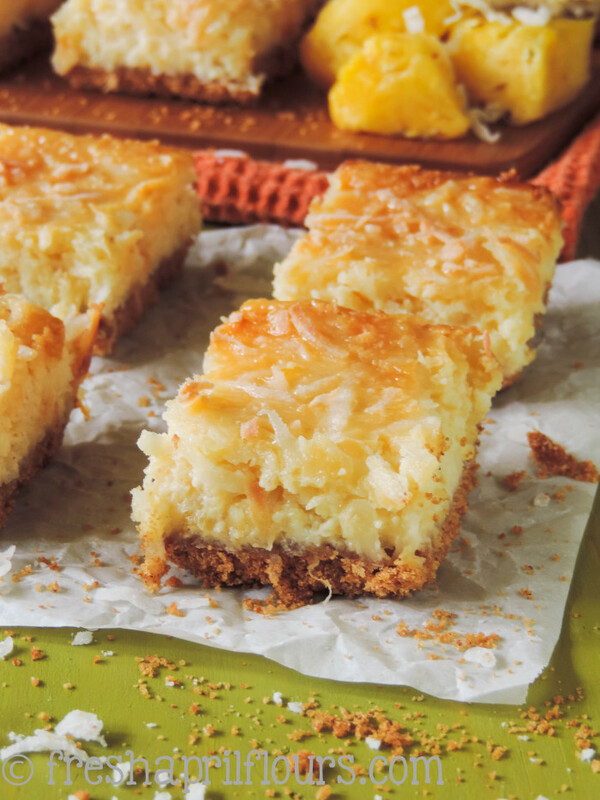 Pour filling into crust, sprinkle remaining flake coconut on top, and bake for 43-45 minutes. Edges and flake coconut should just start to brown and middle should no longer be jiggly. Allow pan to cool at room temperature on a wire rack. When completely cool, chill in the refrigerator for 2 hours, or in the freezer for 1 hour. 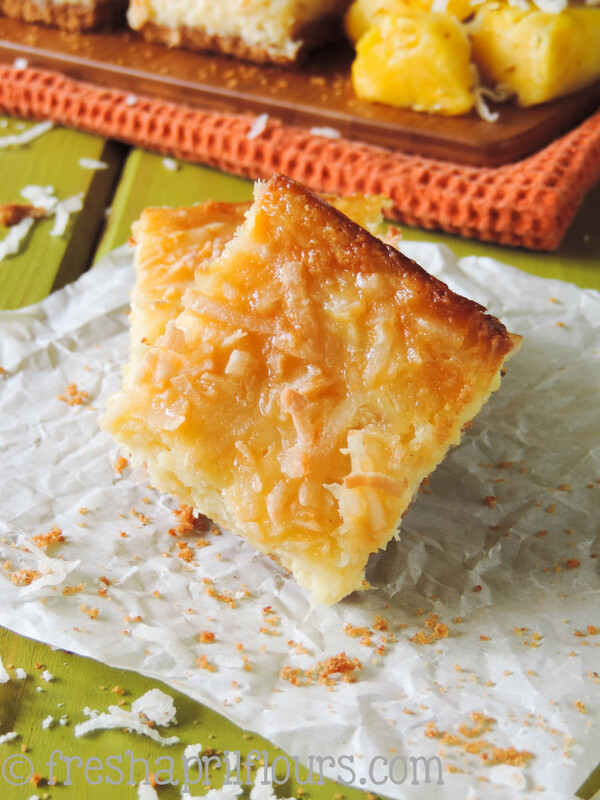 When bars are completely chilled, lift out of the pan using foil overhang and cut into squares. Bars can be stored covered in the refrigerator up to 1 week. If you would prefer to use real rum in place of the rum extract, increase amount to 2-3 Tablespoons rum. You may need to increase baking time by about 3-4 minutes. If you would prefer to use coconut rum, omit both the coconut extract and rum extract and add 2-3 Tablespoons of coconut rum. You may need to increase baking time by about 3-4 minutes. 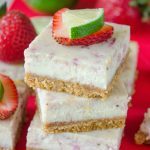 If you love these, there’s a good chance you’ll love this boozy dessert too… Check out my Strawberry Margarita Squares! Yummy!!! 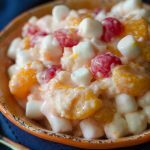 I am not a cocktail girl either – give me a glass of wine or scotch any day over something fruity and complicatedly sweet. 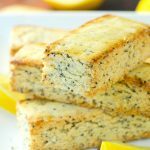 However, I do love sweet baked things, and these sound like the perfect incarnation of a cocktail baked good to me! Also, I might be a bit late to the party but I love, love, love the new website design!!!! Sounds like a great plan 🙂 Surely that midpoint must be a tropical island, right? …I knew I liked you! Haha! Yes! Please do and let me know how they turn out! Next time I make these, real rum it is! Thanks for stopping by, Trisha! My mom loved the cherries too! Thanks, Michele! 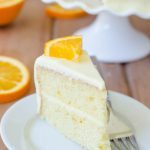 What brand of rum extract did you use in this recipe and where did you purchase it. Hi, Jackie! I always purchase McCormick’s brand extracts, and I find them at my regular grocery store in the baking aisle next to the spices. Hi, Michele! My best guess would be that if you did this recipe one and 1/2 times, it would fit in a 9×13 just fine. I’m afraid doubling it would be a bit too much, but if you try it, you’ll have to let me know! I made these for a potluck this week, and one a half seemed like too much math, so I doubled the recipe and used an 11×15 pan. It worked perfectly and everyone loved them! Thanks, Heather! How did you like them? 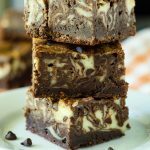 I would like to see how to make these i need the full recipe ! 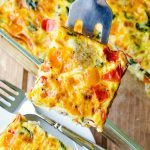 Hi Donna– the full recipe is above where you commented. The end result was SO good! I will defiantly be coming back to this recipe. 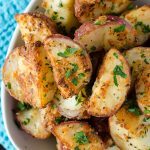 It was easy — and oh my goodness so good! Thank you for sharing. So glad you enjoyed the bars! Thank you for letting me know! I would like to know, can you use Pina Colada drink mix intead of the extracts? Hi, Mary! If the flavor of the drink mix is strong enough, it should work ok. Let me know if you try it! 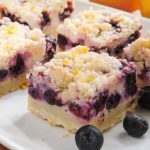 Since I do not care for graham crackers, do you think the shortbread crust you use in your lemon blueberry pie bars would work with this? I think it would be delicious. Hmm, I think it could work, for sure! Let me know if you try it! Made this for a dinner party I went to tonight. It was a big hit!! I opted for the coconut rum over the coconut and rum extracts and it turned out perfect with a few extra minutes of baking time. Everyone loved it (even my friend who’s not a big fan of coconut). Thanks for the recipe! I love this report! Thanks so much, Ryan!